The Laureate thermocouple transmitter provides a linearized, highly accurate, stable and repeatable transmitter output for thermocouple types J, K, T, E, N, R or S. The thermocouple type and temperature range, specified in °C or °F, are user-selectable. The temperature range can be as wide as the entire span of the thermocouple type, or as narrow as 150 counts (such as 15.0°), limited only by considerations of electrical noise and digital filtering time constants. Digital calibration of all thermocouple ranges is performed the factory, with calibration data stored in EEPROM on the signal conditioner board. This allows signal conditioner boards and ranges to be changed in the field with no need for recalibration. Cold junction compensation automatically corrects for temperature variations at the thermocouple reference junction at the transmitter. Open sensor indication is standard and may be set up to indicate either upscale or downscale. Fast read rate at up to 50 or 60 conversions per second while integrating the signal over a full power line cycle is ideal for peak or valley capture and for real-time computer interface and control. 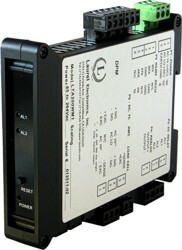 Note: The same signal conditioner board can be user configured for all thermocouple types listed and °C or °F.